For Immediate Release – Oklahoma City, Okla. – May 10, 2017 – Following a successful event for his offspring at the National Reining Breeders Classic (NRBC), the National Reining Horse Association (NRHA) is excited to announce that the legendary stallion and NRHA Hall of Fame Inductee Gunner (AQHA Colonels Smoking Gun, APHA Colonels Smokingun) is unofficially the newest Nine Million Dollar Sire. He is only the third sire to reach this milestone. Unofficially, Gunner’s offspring earned in excess of $131,000 at the 2017 NRBC, helping push the late sire over the nine-million-dollar mark by $63,000. 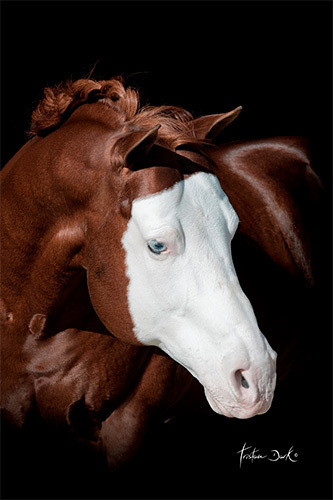 Owned by Tim and Colleen McQuay of McQuay Stables Inc., Tioga, Texas, the 1993 stallion was bred by Eric Storey of Henagar, Ala. By Colonelfourfreckle and out of Katie Gun, Gunner was a stand out in the show pen. Some of his accolades include: 1996 NRHA Open Futurity Reserve Champion, 1998 NRBC Open Reserve Champion, and 2001 United States Equestrian Team (USET) Festival of Champions National Reining Champion in Gladstone, New Jersey. His NRHA lifetime earnings (LTE) total more than $173,700.